Law’s Diontae Eady attacks the rim during Thursday’s game against Foran. MILFORD — The last time Foran played Jonathan Law was in February of last season and the Lawmen needed a victory to qualify for the state tournament. Foran had already punched its ticket. Law won that night to make states for the first time in eight years. Fast forward to Thursday. Law moved to 3-0 this season with a 72-34 victory over the 0-3 Lions in the Edna Fraser Gymnasium. 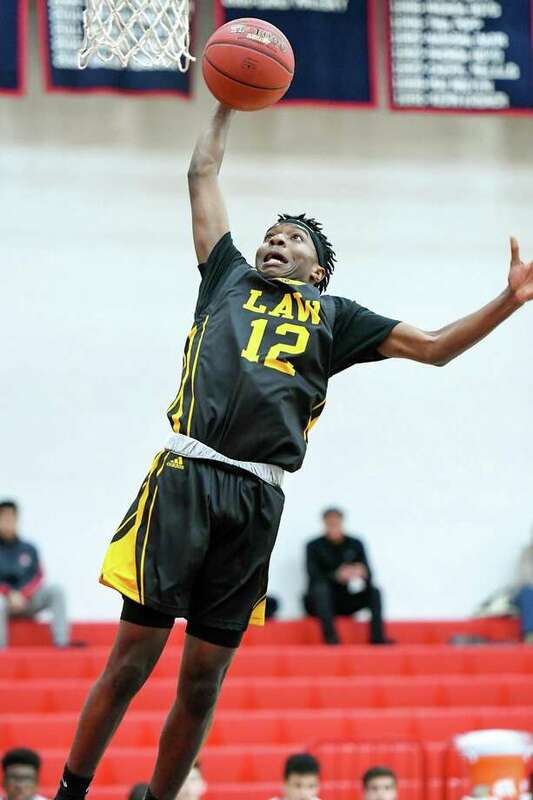 Diontae Eady scored 25 points for the Lawmen, who took a 17-8 lead after one period and extended it to 37-11 by the half. A junior, Eady was balanced in his offense with six points in the first quarter, eight in the second and 10 in the third. Foran’s junior standout John Shannon drained a pair of 3-pointers in the first. Jon Vitale was a mainstay in Law’s 20-3 run in the second period. A junior, Vitale disrupted Foran’s offensive flow and led Law’s transition game. The third period was the most contested. Law’s Tyler McKenna-Hansen scored a pair of buckets from the block, with assists going to Garrett Tutlis and Zane Birks. Foran’s junior captain Jason Giambra battled inside for the home team He scored early on a press-break bucket and late in the quarter on an aggressive put back. Birks tallied six Law points in a row midway through the stanza to take the lead to 53-20. In the final frame, Foran came out firing and scored on four consecutive possessions. Michael Simonelli and Richard Prosser knocked down 3-pointers, around a long-range jumper from Jimmy Coleman for Law. A spectacular save by Simonelli of a ball going out of bounds — and his long scoop pass — led to a run-out hoop by Giambra. Eady added his final bucket, Vitale made a brace of free throws, and then Antonio Brown scored Law’s last six points on the night. Last year, the Lions as the No. 22 seed upset No. 11 Rockville in the Division IV playoffs before losing to No. 6 SMSA. The Lawmen, as the No. 24 seed, upended No. 9 Classical Magnet then fell to No. 8 Lewis Mills. Law returned seven players who found the box score in that qualifying game. Foran brought back one starter from a senior-dominated squad. That is the crux of the matter moving forward. Time in the gym is as valuable for a veteran team. Diontae Eady, Law — scored the 25 points, but it was his penetrate the lane or baseline and dish the ball off to teammates that made him the most valuable. Oh, and he had 10 steals. — Foran coach Ian Kirkpatrick.